Body painting festivals occur every year throughout the world and all body painting artists, from amateurs to professionals gather here. The art of body painting can transform a human being into an exclusive work of art. It creates a more appealing presentation and adds meaning and significance to an important event. Body paintings are usually seen at football matches, rave parties and some festivals. The World Body Painting festival in Austria is the biggest art event held till now in the body painting category. There are tens of thousands of visitors who come to see and admire the brilliant work of participants. There are a wide variety of body painting festivals today. Well, here are worldâs seven greatest body painting festivals. The world council of painting festival takes place at Seeboden in Austria and is a three â day festival. It includes some surprising body paintings that you will never be able to see again. It also includes other entertainment like live dance and music, a giant firework show and a number of other contests. The dance includes some body painted dancers which will be a great entertainment to the viewers. There will also be workshops and photography and also many contests for the effects of UV rays, cost of unique effects, etc. This festival is one of the best with amazing styles and themes. Totally, it is worth a visit. This is a magnificent body painting festival where many artists gather together. The art type is similar to the one which will be seen in the World body Painting Festival. The festival takes place every year in Columbia Nanaimo, British on September 4th and will be continued for two days. But the main events take place on September 4th. There are also many activities like full body painting competition and also a sponge, brush and airbrush body painting with Championships. The earlier visitors have reported that the paintings were very lively and also amazing and the festival was worth a visit. This festival takes place in Mainz, the city which has history for over more than two thousand years. Mainz in Germany had this festival situated on the river Rhine which is known to be having strong Celtic roots is founded by the Romans in about 13th century B.C. Now, you can imagine how long the history of body painting trades here if you knew the fact that the people of Celtic tradition used to paint their body before entering a battle. With such a long history about body painting, this place is an excellent spot for the festival. There are also many contests for face painting and special effects. It will usually be held in weekends as many people would be able to go to the festival. The festival is a little younger, as it was established a bit less than the other three. But still, there are many magnificent works of art which will be displayed and thatâs more than enough for a beginner. This makes an excellent event for a family trip as the festival is fun; including amazing works of art and family participation is also encouraged. The festival takes place for a period of two days in Wales. Though the artistic range is small, it is quite impressive. There are also many events for young participants with an atmosphere which is suitable for all ages. This festival takes place in United Ashford and continues for a period of two days like the other four. It includes the funniest body paintings you could ever find. It is not only about body painting but it is more like a country fair making it a perfect place for outing. The events include face painting, body painting competitions for both amateurs and professionals, craft fair, fun activities for kids and there are also some workshops. This festival was announced as an event for family trips and even the painting cost was low. The U.S Body Painting Festival, also known as Painting Festival of New Mexico, takes place in Alberquerque in New Mexico for a period of three days. The festival displays some of the worldâs unusual body painting designs which are quite impressive. All Americans have free entry to this festival. The body paintings are done in such a way that it makes the model look like he/she was flying in the wind. This is not an event for family outing as children under 18 years are not allowed. Like the other festivals, this one also includes many contests and workshops. To conclude, it is an excellent mixture of many impressive artworks. You will be excited to find something unusual that you had never seen before. The festival will be organized jointly by the manager of the Make Up Institute and The world body painting association in Stockholm. The main concept of the festival is Human and Nature in Frame. 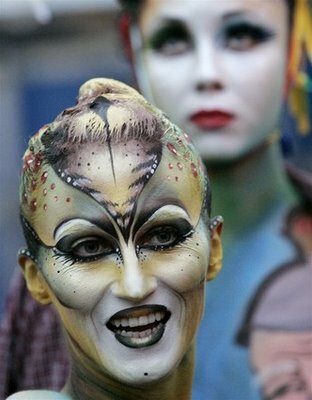 Many body painting professionals across the world come to participate in this event. The body paintings are just fascinating and the festival is worth a visit.